DCI.org blogging live from Lucas Oil Stadium this evening! 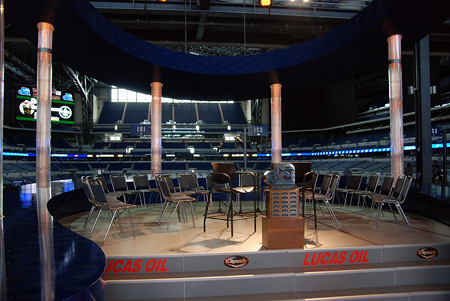 This evening a select group of drum corps fans will gather at Lucas Oil Stadium in Indianapolis to be members of a live audience who will watch and interact with hosts Steve Rondinaro and Dennis DeLucia as they tape exclusive features that will appear as part of Drum Corps International's spring cinema event, "The Countdown." The program, which will appear in movie theaters nationwide on Wednesday, May 13, will also include six full-length drum corps performances that were chosen by fans, along with previews of the 2009 DCI Tour, and more! For those who are not lucky enough to be part of this special studio audience, Drum Corps International's Michael Boo and Chris Weber are on the scene blogging from the event as your eyes and ears to let you know what's going on at the shoot, tell you more about this year's "Countdown," answer your questions, and even give you the chance to win tickets to the show! We hope you will join us! Check it out here starting around 4:30 p.m. Eastern time!